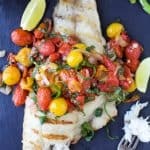 Grilled Red Snapper topped with a Roasted Red Pepper and Charred Tomato Relish for a light and fresh 30 Minute meal perfect for summer! Add tomatoes to a small bowl. Drizzle with 1 tablespoon of olive oil and season with salt and pepper. Toss to coat. Drizzle 1 tablespoon of olive oil on whole red pepper. Rub the oil around the pepper to make sure the whole thing is coated. Do the same with the shallots. Add tomatoes to a grill basket and grill for 5 minutes, tossing throughout. You’ll want to remove them when they start to burst. At the same time add red pepper and shallots to the grill. Grill each side of the shallots for 3 minutes. Grill each side of the red peppers for 3-4 minutes. Remove from grill and place the red pepper in a bowl. Cover the bowl with plastic wrap and let sit for 3 minutes. Remove the skin from the pepper and dice. Dice the shallots as well. To a bowl, add grilled tomatoes, roasted red pepper, grilled shallots, basil, and white balsamic vinegar. Season with salt to taste. Set aside. Drizzle the red snapper with 1 tablespoon of canola oil and season with salt and pepper. Place snapper on the grill, flesh side down first. Grill for 5 minutes. Flip the fish, and grill the other skin side for 5 minutes. Remove from grill and top with charred tomato relish.